Today I baked up some of my favourite chocolate chip cookies. They are thick, with crisp tops and edges, soft, chewy centres, and loaded with chocolate chips. I absolutely love them! You have got to give these a try. Preheat oven to 350F/176C. 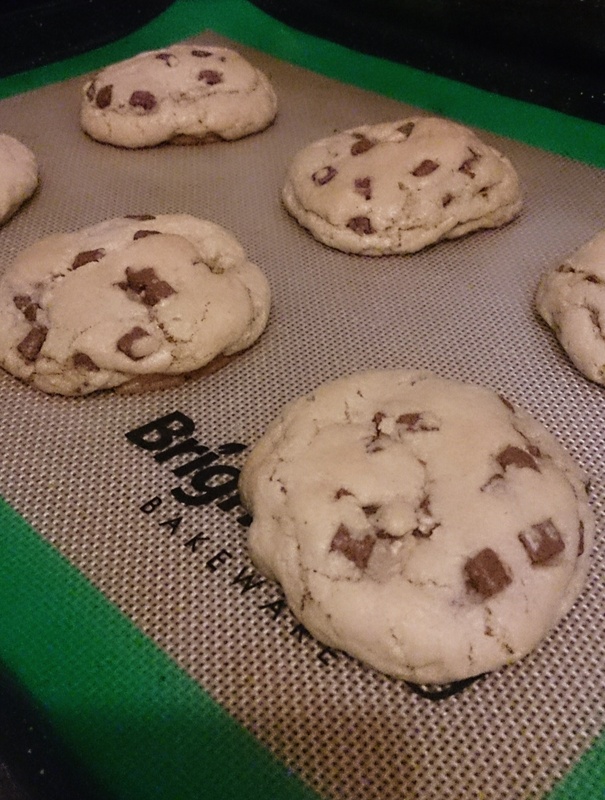 Line baking sheets with parchment paper or baking mats, set aside. Place butter in a microwave safe bowl and heat for 30-45 seconds (full strength) or until it’s almost completely melted but has a few soft pieces left. In a large mixing bowl, whisk together flour, baking soda, cornflour, and salt. In the bowl of a stand mixer (or a large mixing bowl with a hand mixer), beat together butter, sugars and vanilla for 1 minute. Add the egg and mix well. Turn mixing speed to low and gradually add in the dry ingredients. Beat until just combined or until a soft dough forms. Fold in the chocolate chips with a spatula. Now you can either bake the dough straight away, chill for 3 hours and bake, store in the refrigerator for up to 5 days or freeze it. Roll the dough into 2oz balls, and place on the prepared baking mats. Bake for 11 – 13 minutes until the edges start to brown. Leave for about 5 minutes before transferring them to a wire rack. Hi! I’m Marsha. I am the baker, recipe developer, writer, and photographer behind Marsha’s Baking Addiction. Whether you like cookies or cakes, you’re sure to find something here to sweeten your day!